This side of the game is a bit superficial, but it gives you something to do between races and there is something peculiarly satisfying about going through your sponsor slots and deciding whether to take up Fila's offer of a few thousand quid every time you place above 5th, or taking a bigger total from Max Power but only for podiums. Likewise, hiring a team-mate may be expensive, but it will pay off if you go for a Pro Tuned specialist just before you tackle a run of those races, although we could do without the radio banter from mechanic and team-mate, which is repetitive and mildly irritating (even if you can get him to call you "Maverick"). You can also buy and sell cars on eBay Motors instead of just buying and selling them, although beneath the slightly different listings it's just the same menu with some advertising on it. And despite the sideshows, GRID World's season-by-season racing-team structure is a bustling success, building up a bit of basic Princess Peach in Mario Kart-style rivalry (Tom Kristensen - spit! ), allowing for showpiece head-to-heads with your hated rivals (Ravenwest - spit!) at the end of each tier and a seasonal outing at Le Mans, beginning as a freelance for third- or fourth-tier teams struggling for 12th place, and eventually slugging it out in ten-million-pound Audi R10s at 250mph for the win. Each Le Mans lasts 12 real-life minutes, going through a complete day-night cycle, and the monstrous high-speed straights of Circuit de la Sarthe are a welcome alternative to the usual Nurburgring Nordschleife, which has been the arcade racing game's massive lap of choice for the last few years. Most of GRID's other tracks share Le Mans' agreeable blend of tricky technical demands and showpiece visuals, whether it's the long left-handers at Okutama with their awkward, jutting rumble-strips in the shadow of a mountain; learning to cut corners by riding sideways across the raised pavement in San Francisco, dancing between opposing right-angle corners on a tarmac and tram-rail floor amongst tall, oppressive buildings next to the bay; riding the Hachiko Drift circuit in the politely and apologetically cone-ringed, rain-slick Shibuya; the lollipop hairpin at Long Beach; or staring incredulously into the dark during the night-time lap at Le Mans, scared of the next corner. Wherever you are, Flashback means you can actually laugh at the odd spectacular crash, and then zip the image backwards and forwards like a DJ scratching a turntable for your own amusement. We're not quite in Burnout Paradise territory with the visual representation of damage, but in many other respects GRID is a truly beautiful racing game: the cars are dazzling, whether you're watching the evening sun glide down the side of your first Mustang or watching an F1000 go-kart take off onto a crash barrier as you brake poorly into a tight turn. There's a slickness and polish at work that rarely slips. 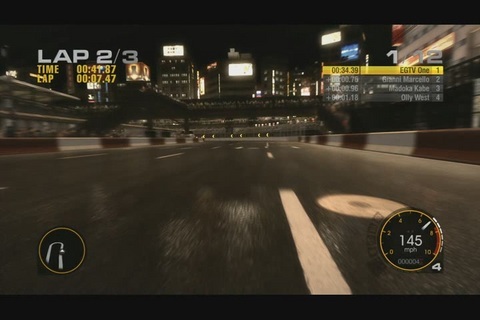 It's most apparent in the little things: the serenity of the garage scene menu backdrop, with the camera bobbing slightly as if on the breeze; the crash-zoom GRID World intro to starting grid close-ups; the Achievement progress notifications on the loading screens; the seamless ghost-car downloads for world records in Test Drive mode; the range of driver assists, which most will want to turn off, but which reduce the strain on those who struggle. We prefer the bumper-cam view (in all things, you know), but the in-car and external views are great for showing off to friends. Where GRID loses out is in relative trivialities - until you've learnt the track layouts, for instance, you might pine for PGR4's "racification" finish, which illustrated braking distances and racing lines subtly but effectively and is missed here. Despite the damage modelling, it's also still possible to bully the other racers out of your path - although not to the same degree as GT or PGR - and in a game this good looking, not being able to save and share replays online is disappointing. Otherwise, GRID is a great success: the single-player is varied without being confusing; the online multiplayer supports 12 players and damage modelling, reducing the number of first-corner pile-ups; tracks and cars are well chosen and recreated; and Flashback allows you to race with the same determination on lap three as you did on lap one, mitigating risk in a manner of which other racing game developers will soon be envious. Even if GRID doesn't give Codemasters parity with PGR in US sales, as the developer hopes, it's a fine achievement and an early leader in the race to be 2008's best driving game. Race Driver: GRID is due out on PS3, 360 and PC on 30th May.